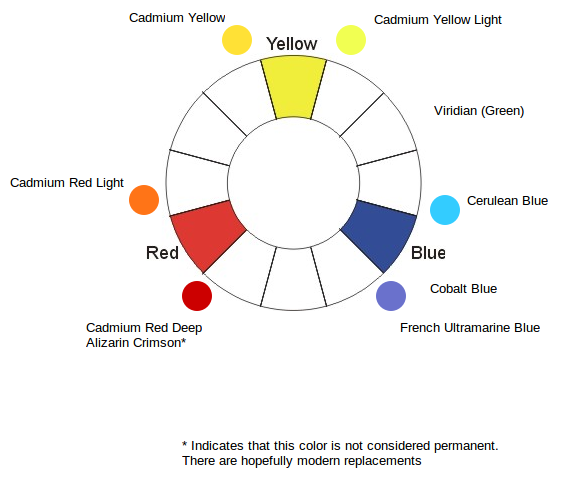 Here are some paint suggestions based on the 6 basic colors. There are other colors that can be used, but this is a good starting point. Also remember that pigments are not the same as colors. Pigments have a life and a chemistry all their own. If you paint with oil paints, you will also need to consider the whites you use. Titanium white is very opaque, and can significantly affect your colors when mixed into them, resulting in a chalky pastelly color. Zinc white is more transparent than Titanium, but it tends to flake and crack. A Titanium / Zinc white mix is commonly used these days, with about 2/3 Titianium to 1/3 Zinc. Lead white is great, and was about all that artists had until the 20th century. One difficulty with Lead white is its very fast drying time, which can lead to cracking when laid on top of other slower drying paints. This can be somewhat mollified by using a slower drying paint with the Lead white.